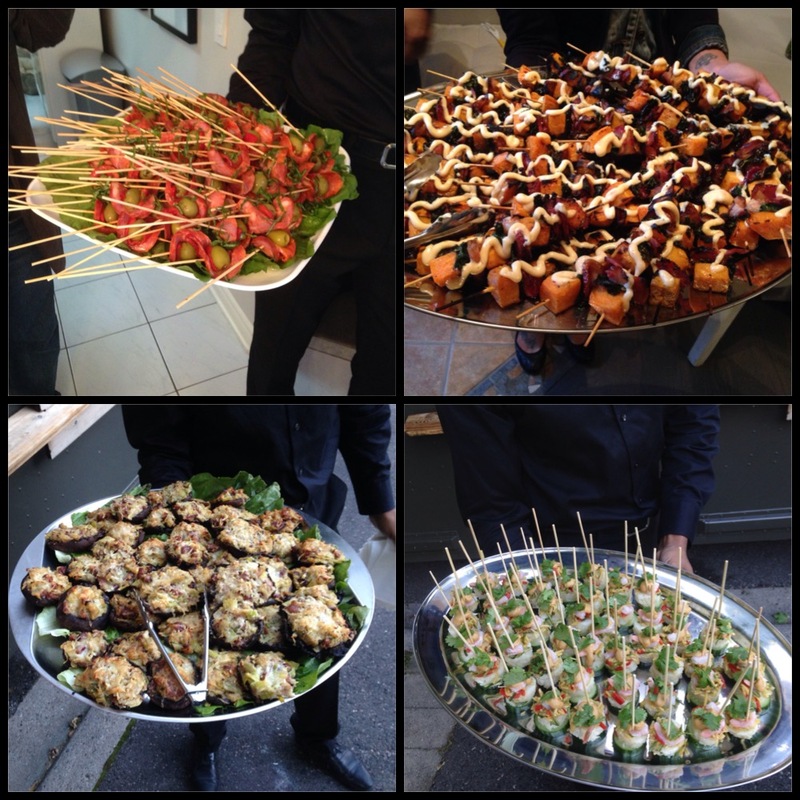 HighVail Goes “Eat Street” for Family & Friends Soiree! HighVail Systems Inc. has always known that one of the secrets to success is how you treat your employees. The company has created an environment where FUN is taken seriously, both inside and beyond the office. 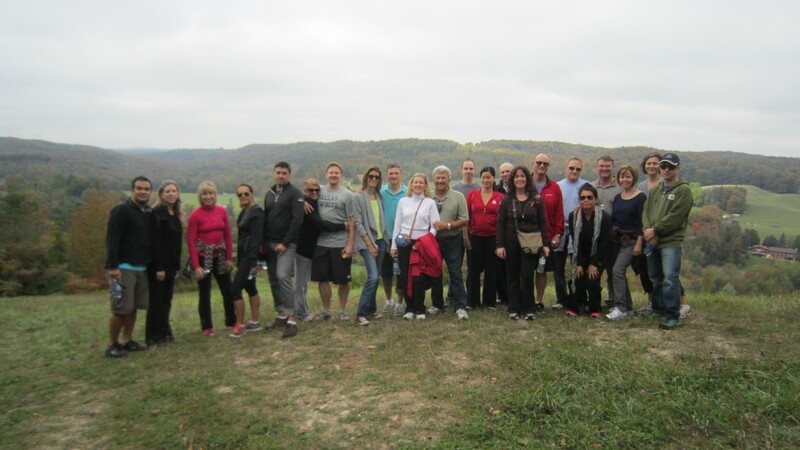 Work/Life balance is also one of our core values. Most importantly, HighVail is not just a place of business; at HighVail, we are a family, and we treat our clients, suppliers, and anyone we do business with as our friends. 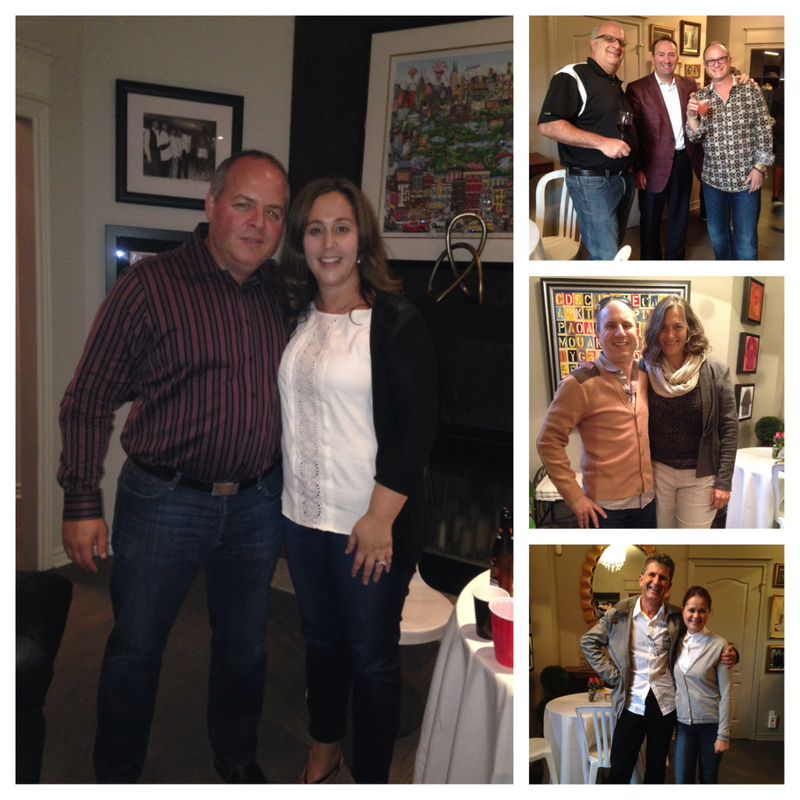 Throughout the years HighVail has had many events that focus, particularly, on bringing our employees together, such as family BBQ’s, our incredible After-New Year parties, and last fall, our very first company retreat at the Hockley Valley Resort & Spa. Celebrations are very important to us, contributing to more positive energy, heightened workplace happiness, better relationships, a higher level of unity, and strengthened communication. Our latest event took place a couple of weeks ago. 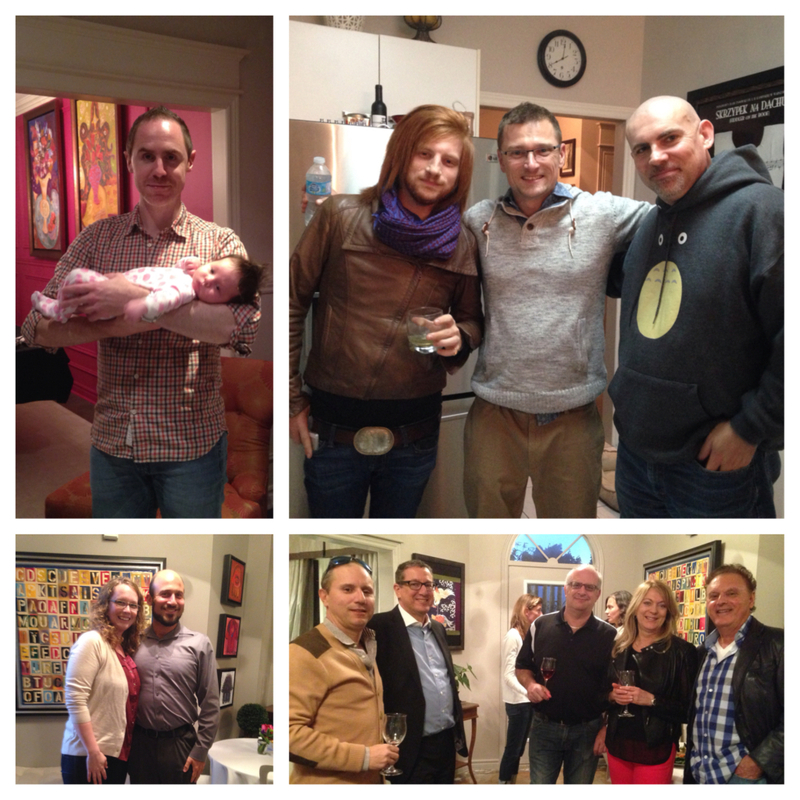 Thanks to HighVail’s own Shana Otter, we shared a very exciting, unique kind of soiree. Shana arranged for her good friend, fabulous chef Jonny Blonde and his crew, from Hamilton, Ontario, to bring their food truck right to our driveway! We didn’t realize what a cool evening we were in store for! What a perfect way to end the summer and usher in a new season. Havin’ fun with the Jonny Blonde & Core Event Staff Crews! Sil is holding Coco in one photo and delicious hors d’oeuvres in another: Chicken Satays & Jonny’s Sauces (thai peanut, chimichuri & Piri Piri) #nomnom; Rafaella is serving decadent cocktails, and I’m in the truck with Hady, Jonny & Layal! 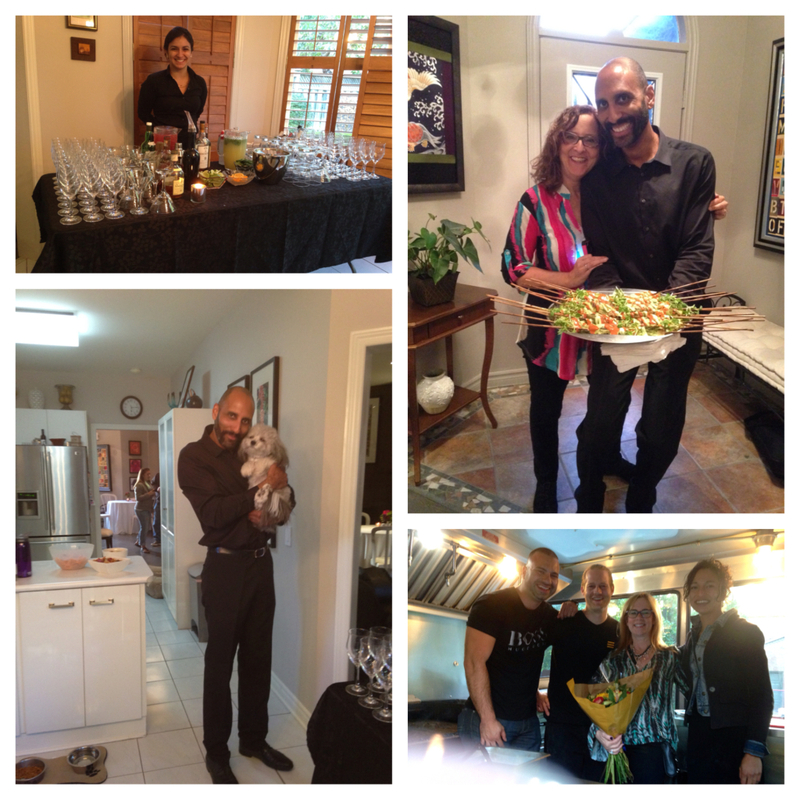 We have relied on Toronto’s Core Event Staff for almost 10 years, both privately and for corporate events, and have never been disappointed. Au contraire, every chance we get, we rave about them and would never have an event without them! I couldn’t say it any better than their mission statement: “The secret to our success is our ability to repeatedly deliver qualified, hospitable staff with a genuine desire and commitment to make each client’s vision a reality” Their vast repertoire of clients is impressive and each one, whether a large, high-end venue or corporation, or a small family celebrating a holiday or special occasion, is treated with the same care and dedication. We know that with their ridiculously friendly, most professional, warm, caring, thoughtful, and excellent staff, nothing can go wrong! 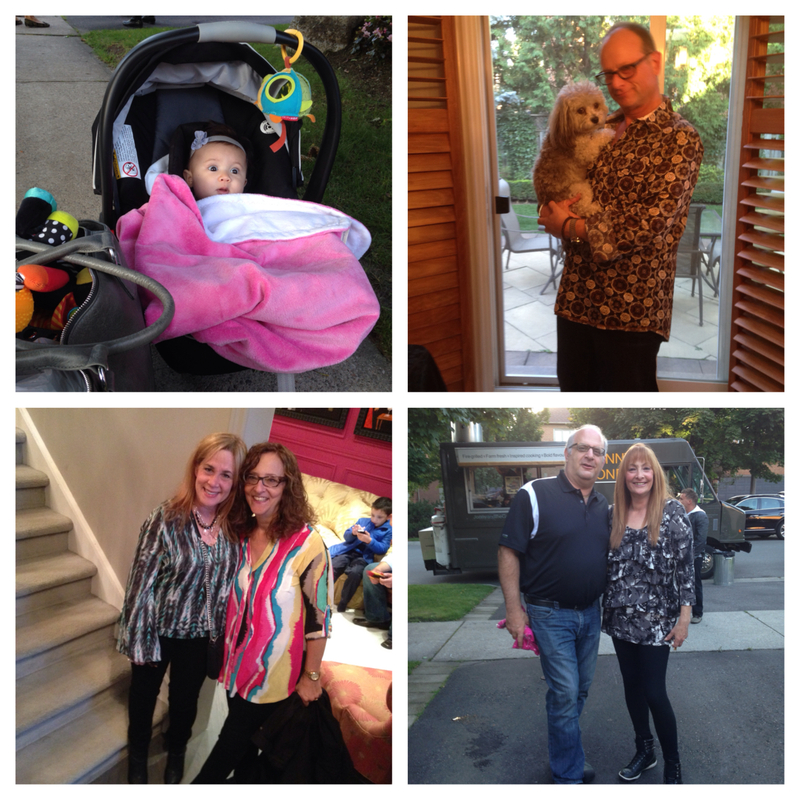 Sweet babies, family, friends, neighbours, and one of our puppies, Coco! Event staff, and the Jonny Blond team! 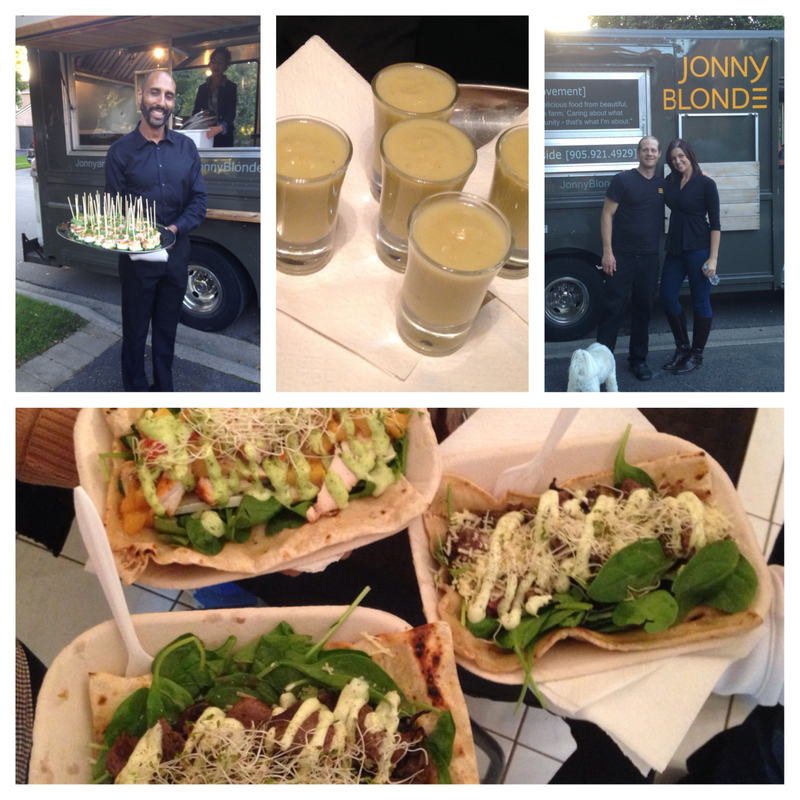 Jonny Blonde is not just a food truck, but an elegant, gourmet foodie’s heaven on wheels! Using only the finest ingredients, such as fire-grilled, locally-raised meats and the finest seasonal produce, their food is not only innovative & tasty, but farm fresh and mega-healthy. 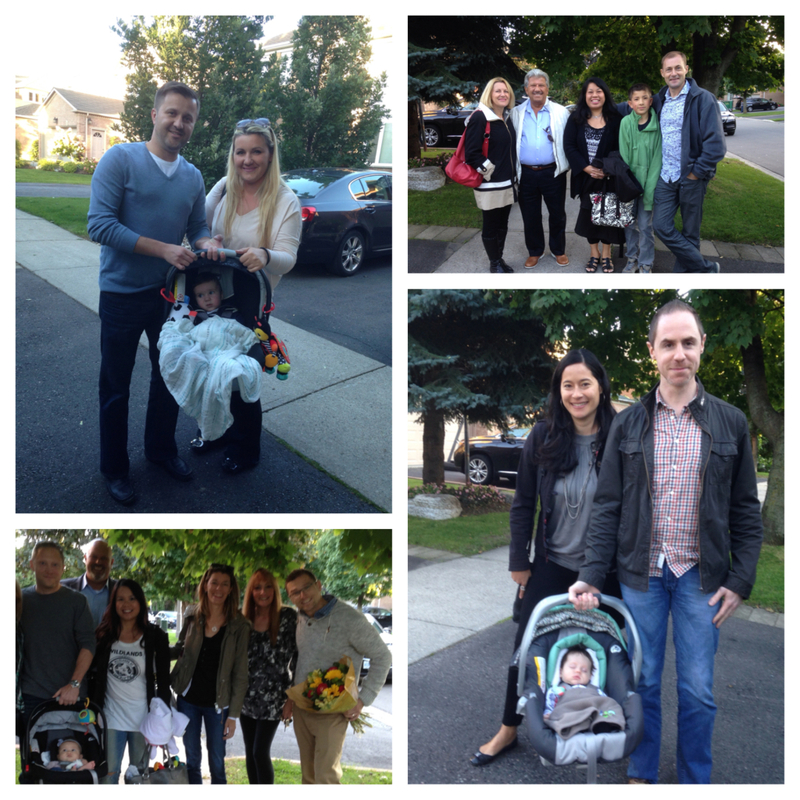 It felt like a Hollywood set right on our quiet, suburban street! 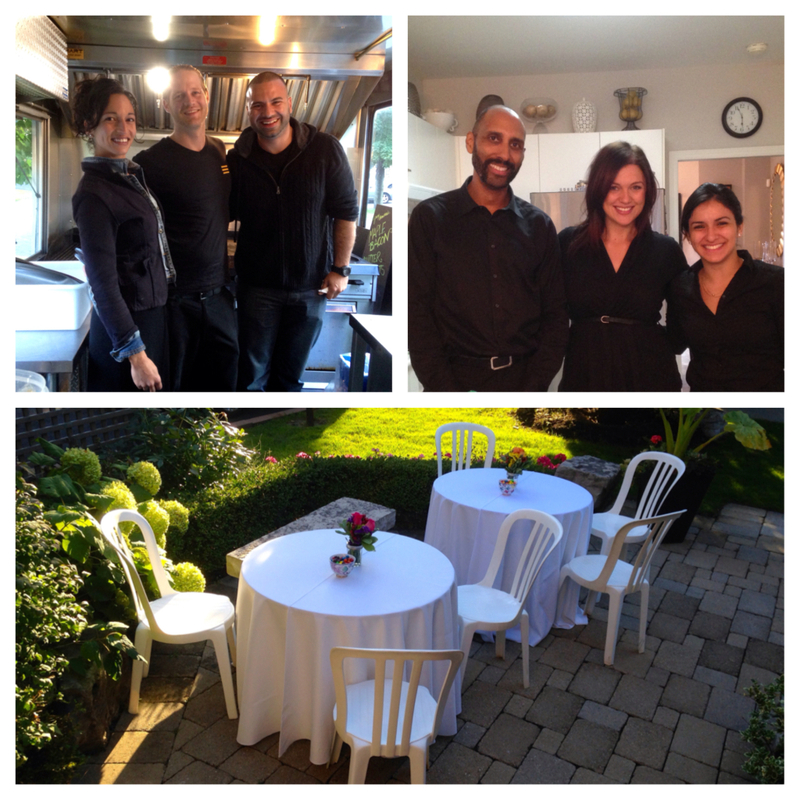 We felt so fortunate that Jonny Blonde, voted View Magazine’s People’s Choice for Best Food Truck and Caterer of 2014 in Hamilton, made an opening in their busy schedule to travel all the way to our home in Thornhill, Ont. so we could partake in this gastronomic explosion of taste and most memorable experience! And the weather was purrrrfect! Be sure to tune in to the Food Network’s “Eat Street” on October 18th to watch them in action when their segment will be aired. Jonny runs his food truck and business together with his lovely girlfriend and business partner, Layal, who also has a neat website, www.JonnyandtheGypsy.com, chronicling their adventures. 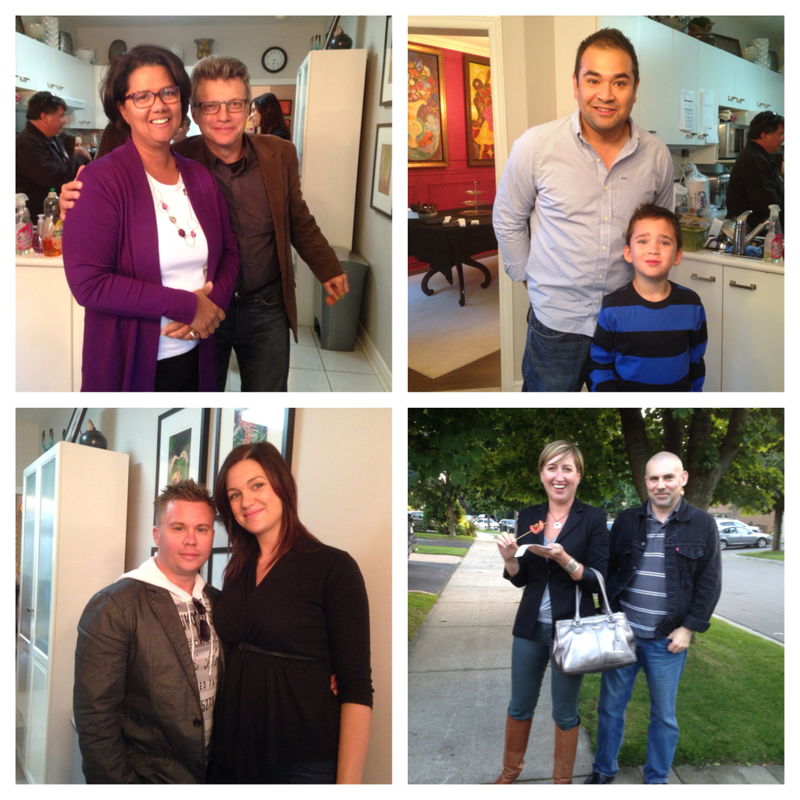 Jonny, Layal and Layal’s brother, Hady, were all at our event, making the night one dazzling one! After mountains of unbelievably delicious hot & cold appetizers and finger foods, I seriously don’t know how we made room in our appetites for the main dishes – Irresistible melt-in-your-mouth gourmet sandwiches that were visions of art on a plate. Everyone had a blast going right up to the food truck window and ordering their choice of sandwich. The chatter was so loud and boisterous that no one would even notice the music playing in the background. Everyone was having a blast connecting, socializing, laughing, schmoozing, and having a generally great time. We were really lucky that some of the people at HighVail with newly born babies brought these little angels to our little shindig. So yummy and adorable! Five out of the three newly born infants joined us as well as some of the older children, who were equally amazing! What an awesome crowd! I always say how fortunate everyone at HighVail is to have such a fabulous, cohesive, great group of people who can both work hard and play hard together! An alluring sweet table was set up for dessert but as you can imagine, no one had any room left for anything more, so copious amounts of doggie bags left through the front door filled with decadent The Cheesecake Factory Red Velvet, Vanilla Bean, and Blackout cupcakes, colourful French Macarons in a dizzying array of flavours such as Cotton Candy, Passion, Red Velvet, Purple Vanilla, Dark Chocolate, Pink Lemonade, Lychee Ice, Green Coconut, Espresso Raspberry, Caramelized Chocolate & Nutella, made by Petite & Sweet Bakes from Pusateri’s Fine Foods, Caramel/Chocolate enrobed popcorn with nuts from Rocky Mountain Chocolate Factory, and melt-in-your mouth Godiva chocolates. Yes, there was a healthy option too – my home-made tropical fruit platters! 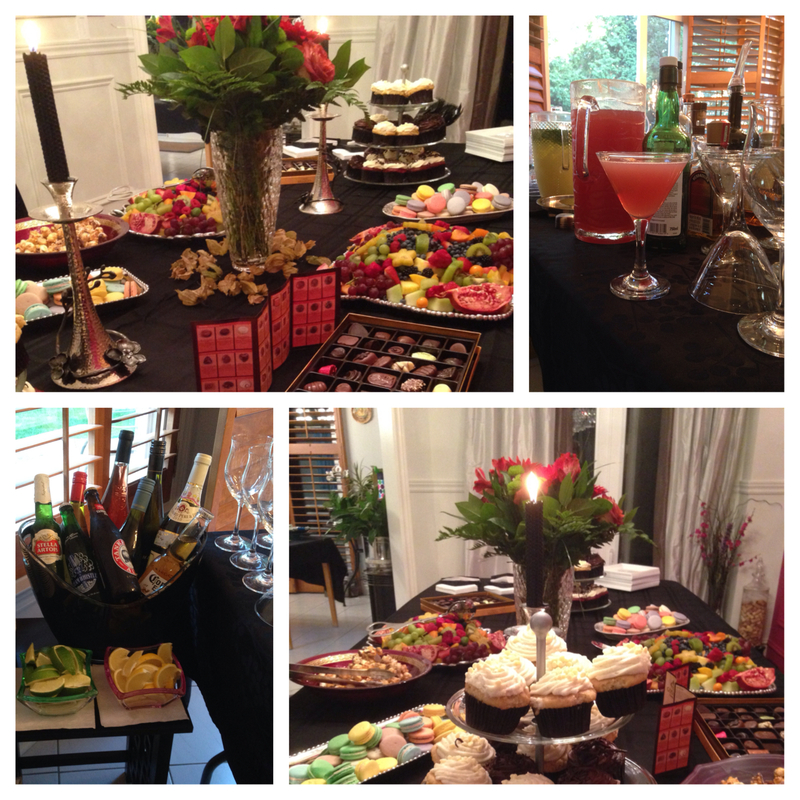 Decadent desserts & cocktails – what could be better! leave you, my friends, with the following powerful yet simple quote by American internet entrepreneur/venture capitalist, and CEO of Zappos, Tony Hsieh: “Treat Employees Like They Make a Difference and They Will.” This is definitely a value we at HighVail stand by with pride. 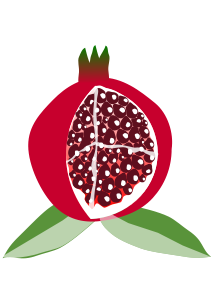 Let Pomegraddict come to you! After clicking the "subscribe" button below, look for an email from Pomegraddict. Be sure to confirm your subscription by clicking the email. You will then receive an email notification whenever there's a new blog post for you to read. Welcome to my lifestyle blog. Why Pomegraddict? I’ve always been fascinated with the sensual pomegranate – the colour, texture, shape, taste, and spiritual connection. Every time I see this luscious nectar of the gods, it does something quite positive to me. This unique crimson-red burst of energy kissed by the sun has a way of instantly raising my serotonin levels. I'm addicted! 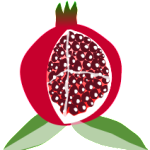 This is what I want to write about and share with my readers: how life can be exciting, alluring, mysterious, and uplifting every day, like the effects of the pomegranate on me! Whether you’re driving with the top down on your car, donning your Audrey Hepburn shades, or in your kitchen preparing dinner for your family….wherever you may be, may the magic of the pomegranate fill your heart with love, and may you get as addicted to life as I am! 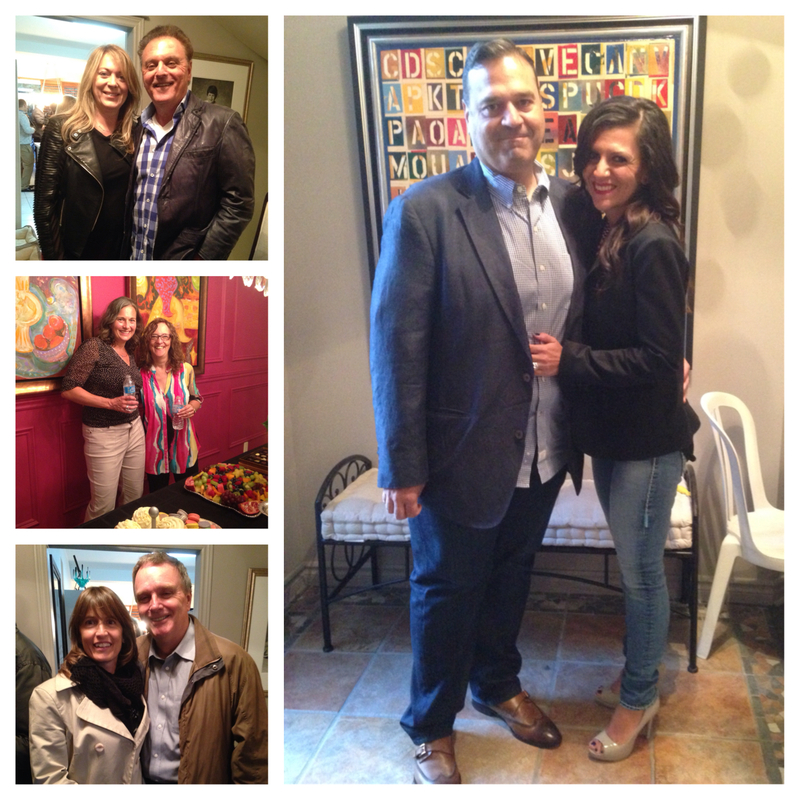 Passover Traditions, Memories, Borscht Martinis & Drunken Pharaohs ! 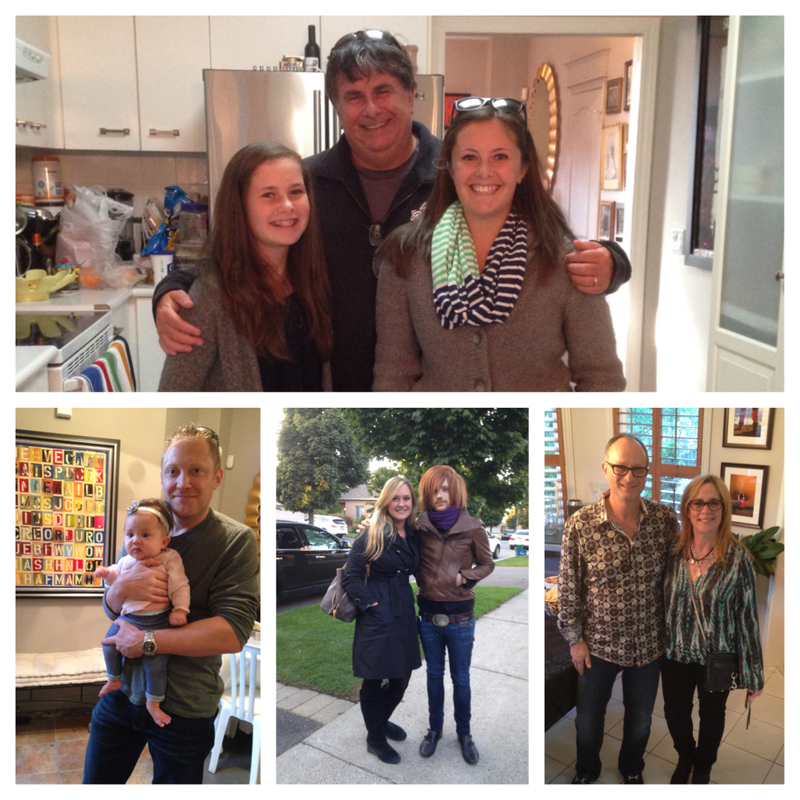 pomegrad on Passover Traditions, Memories, Borscht Martinis & Drunken Pharaohs ! Blogs & Websites I Love! Hi there! I’m Pomegraddict but my real name is Joanne. I love being a mom to the two most incredible children. I love events and living life to the fullest. This lifestyle blog is a hobby of mine. With all the bad stuff going on in the world, it’s sometimes hard not to feel down, discouraged, and pessimistic about all the great things that also exist. I am always looking for ways to raise the spirits of others and myself. That’s why I began my blog. I love to write about trending topics, and also, about exciting events I attend and events I organize both personally and in the corporate realm, for HighVail Systems Inc. My experiences are mainly in Toronto (where I live) and Montreal (my hometown), but also cover many of the places I travel to.